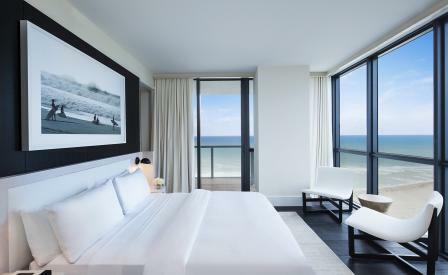 Having worked a couple of high-profile properties for the Starwood Group – the W Maldives, and the W Montreal spring to mind – it seemed only natural that the designer Anna Busta would be tapped for the job of sprucing up the upper category rooms at the W South Beach in Miami. Sensibly, the Tappan-based Busta allows the views of the Atlantic Ocean to dominate her mood board for the E-WOW suite, with each of the three bedrooms leading onto a balcony that offers an uninterrupted sweep of sky and sea. Inside, monochromatic hues are set off by dark hardwood floors, black marble, and mid-century leather lounge chairs. Potential monotony is held at bay by bold slashes of white, including a handmade shag rug in the living room, mother of pearl wallpaper in the guest bathroom, and a glossy lacquered dining table flanked by white leather chairs. Busta, however, isn’t quite done, tempering the largesse of the suite with quieter moments, such as when she installed a Japanese soaking tub in the master bathroom, and dressed the walls with photographs of the ocean that were curated by property magnate and art collector Aby Rosen, alongside a triptych by the Los Angeles-based photographer, Jordan Sullivan.